When Navy Commander John Rodgers and his crew arrived in Hawaii on September 10, 1925 on thefirst trans-Pacific air flight, they fueled the imaginations of Honolulu businessmen and government officials who dreamed of making Hawaii the economic Crossroads of the Pacific, and saw commercial aviation as the road to that goal. Two years later on March 21, 1927, Hawaii’s first airport was established in Honolulu and dedicated to Rodgers. When Inter-Island Airways began the first commercial passenger flights between islands in 1929, their hangar was one of two on the airport. Rodgers Airport catered mostly to private pilots and Inter-Island Airways until World War II when the Navy constructed a terminal and related aviation facilities on the South Ramp. After the war, the airport was returned to the Territory of Hawaii and commercial aviation grew by leaps and bounds. The airport was renamed Honolulu Airport, and later Honolulu International Airport. As new and bigger planes were designed, the airport rushed to keep pace, constructing the current airport facility on the North Ramp in 1962. Upgrading the facility to keep pace with the ever-changing needs of the airlines and other aviation related activity continues. 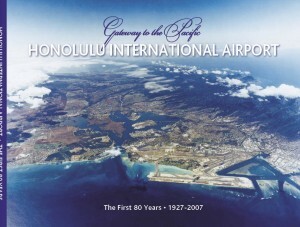 Honolulu International Airport—The First 80 Years chronicles the birth and growth of Hawaii’s premiere airport from its humble beginnings to its fulfillment of the 1927 dream of being the Gateway to the Pacific. There are 184 pages filled with photos, facts and stories of the people and companies who were part of Hawaii’s aviation history. Click on the links below to download pdf files of the book (divided into 30 page sections). Please be patient, the files are large and can take some time to load.